It's easy to drive right pass Shabu Ken and not notice it, but that would be a big mistake on your part. After all, really good Japanese-style shabu is hard to find, and this one serves Wagyu Beef and Kurobuta Pork along with other prime cuts from Australia and the United States. Shabu Ken boasts secret recipes from Osaka, Japan, with three soups (Shabu, Sukiyaki, and Osaka) along with 3 sauces—modifiable with mountains of ginger, chili, and garlic. The best part is, it won't cost you a fortune to fill up. 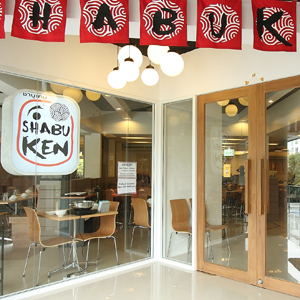 Note: W5 Magazine readers get 10% off Shabu Ken from now until March 2010. Just tell them you heard about the place via W5 Magazine, or print out this page. Pass on the Wagyu goodness. Take a Taxi from BTS Thong Lo Station, enter Soi 9 and turn left at the first intersection (opposite La Villa.) Shabu Ken will be on the right with parking spaces in front.